Click the links below for a listing on sale reports for various CPH-45 sales across the state of Kentucky. Check back often for the most updated reports. ​The CPH Report expands the analysis of CPH-45 sales to estimate the economic value of preconditioning calves prior to marketing. This analysis consists of two main components. 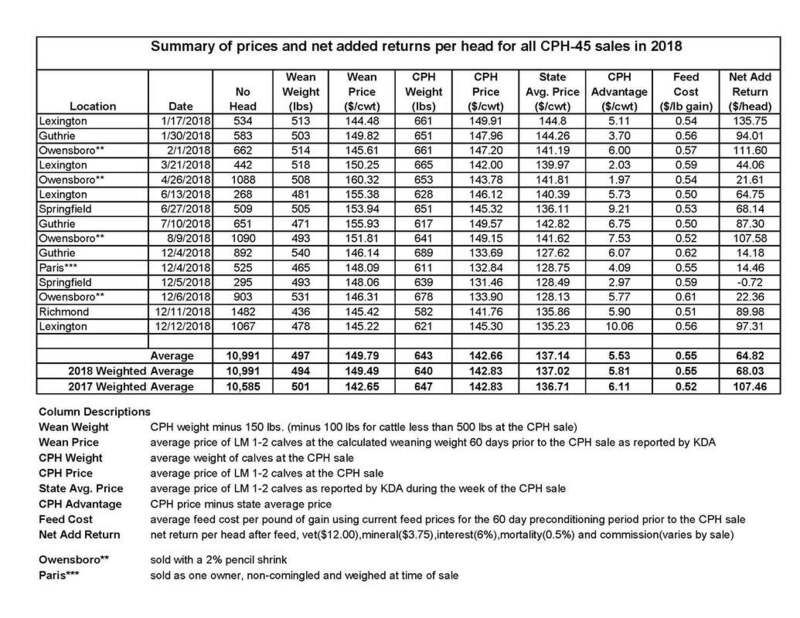 First, is the CPH Advantage – which compares prices received in the CPH Sale to the average weekly statewide prices reported by the Market News Service of the Kentucky Department of Agriculture. The second component is the Estimated Net Added Return – which compares the CPH Sale value of the calf to the estimated value of the calf at weaning. This report will only summarize the CPH Advantage for sales held from April to December in 2018. Eleven CPH-45 sales were held in six locations during this time period. The average CPH Advantage for 3,328 heifers was $7.85. The average CPH Advantage for 4,745 steers was $4.94. In addition to these sales, two Hereford influenced sales (which follow CPH-45 protocol) were held in Stanford. In those sales, heifers were $0.97 and steers were $4.48 over the weekly market, respectively. All locations except Paris sell on a weigh in basis (cattle are weighed on arrival). Paris sold in one owner lots, non-commingled, weighed at time of sale. Owensboro sells with a 2% pencil shrink. Next month we will analyze the Estimated Net Added Return – which compares the CPH Sale value of the calf to the estimated value of the calf at weaning. If you are interested in selling in a CPH-45 sale, contact your local County Extension Agent for Agriculture and Natural Resources or your KBN representative.